Superman's next stop on his journey of self confidence takes him to Proto, Utah. Here the Mayor gives Superman the key to the city and announces today is Utah's Superman Day. Basking in the glory doesn't last as a familiar sound begins to irritate Superman's senses. Next stop, Las Vegas! Former 'Shock Jock' Leslie Willis, the former villainess, Livewire is running amok in Vegas. Somehow she has become even more powerful than before and has taken hostages from gamblers of a nearby casino. Superman rescues Jimmy before he is hit by a lightning bolt and questions the young reporter. Superman is surprised to see reformed Leslie out on a rampage. Perhaps STAR Labs tinkering with her in Texas has unleashed some kind of overload? Jimmy had been investigating the Gorilla mobs rise in Vegas when he stumbled upon Leslie's attack. Superman leaves Jimmy with his Key to Utah on a nearby rooftop and races to confront Leslie. Unluckily for Superman, Leslie is supercharged, absorbing electricity from all around her and making mincemeat out of the Man of Steel. Inside the Casino, amongst the captives are Superman inspiration Iron Munro and a certain possessed school teacher, Miss Jennings. Perhaps the cause for Leslie's suddenly mental lapse Jennings has been caught out. Trapped in a ball of electricity she wastes no time in trying to punch her way out of it. Thrown back by the shock into Iron's arms she drops her Sunstone crystal. As Iron picks it up he is bombarded with memories from Superman's life. The death of Jonathan Kent, Superman mourning his civilization's death and his current feelings of ineptitude. Jennings grabs the Sunstone back severing the mental link Iron experienced. Failing in his fight, Superman overhears Jimmy following up on leads he inadvertently gave his friend. Jimmy has called Dr. Serling Roquette who reveals that Leslie's mind has started to be effected by her energy levels, if only they had a containment suit to regulate it... where indeed? Superman recalls the days when he was like Leslie, and dashes to the Fortress of Solitude and then on to Dr. Roquette in Texas with his old Superman Blue suit. Jimmy confronts Leslie in hopes to buy Superman time to alter the suit and spotting a flagpole on the rooftop he quickly ties the Utah key to it and then hurls it in Leslie - grounding her. Jimmy's plan reverses the effects of Leslie's mania and the hostages are suddenly free from their prison. Jennings, mightily miffed stomps out of Vegas while Iron races outside to stop Leslie who is angrier than ever. Her lightning has no effect on Iron and the surprises don't stop as in the blink of an eye, Superman his stripped her naked and redressed her in his containment suit. The effects are immediate and Leslie is her reformed good girl self again. Leslie adapts the S shield into an L and smiles at her on/off friend. Aside from property damage nobody was hurt so the city is safe. Superman gushes as he meets his childhood inspiration and watches as Iron takes charge to help the authorities clean up the mess. Jimmy is puzzled as to why Superman helped Leslie and Superman explains everyone makes mistakes but America is all about life, liberty, happiness and second chances, it's the American Way. The American Way is for everyone Jimmy. Story - 2: Wow, ban puns, bad jokes, poor cameos and DC turns preachy after their gutsy story in Action Comics #900. I've always enjoyed Livewire's stories, she's one of the better villains Superman has to face but she's been active in the DCU for a long time now living on a planet that thrives of electricity, why now, why here, did she go all villain? I alluded to MY thoughts in the synopsis but it's not made clear at all. Iron Munro discovered Jennings plot and did not tell Superman? Huh? I cannot be-LEAF it. By the way, I prefer Superman the superhero, not the preacher. Make him Super again and leave the puns to bad cartoons. One other gripe. Timeline please?? I know when this story takes place only because I read and reviewed Action Comics #900 & Superboy #7. For example Superboy's title is now 4 months ahead in the future to the Superman books because it has leapt into a new arc after "Reign of Doomsday". Superman interrupts his "Grounded" storyline to take part in "The Black Ring" and "Reign of Doomsdays" but to the casual reader or someone that hasn't been following "The Black Ring"... well it seems like they are out in the cold because otherwise their appears to be two Supermen operating in the DCU - one that's a hero for the American Way and one that believes in Peace & Justice for all. Art - 4: The depictions of Livewire and her battles with Superman were top notch this month. The artwork seemed to make the book fun and action packed for a change, so thumbs up for that! 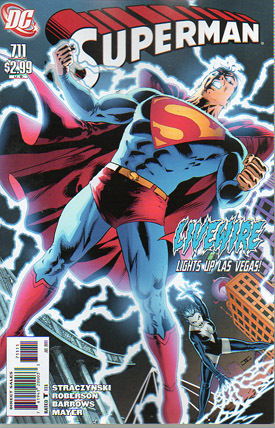 Cover Art - 3: The lightning effect and Superman being blindsided by Leslie looks great. It certainly looks like Superman is in for a good fight! 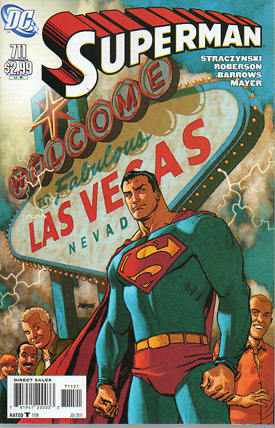 Cover Art (Alternate Cover) - 4: The variant cover, despite not showing any action, makes Superman's visit to Vegas seem like far more of an event on his loooong road trip. I liked this fresher more colorful approach.